I am linking up with Mama Kat for her Pretty Much World Famous Writing Workshop. Assignment: Halloween is coming! Show us what your kids will be wearing. I love Halloween. LOVE IT! When I was a kid, I starting planning next year's costume and yard decorations on Nov 1st. I once carved 5 pumpkins and sat them on our front gate (ok, it was a fence) and sang the song "5 Little Pumpkins" over and over and over again on a tape and played it on Halloween night. I also cut the head off one of my cabbage patch dolls with my dads axe over a wood stump. Then I stuffed some of his old clothes to look like a real man and threw fake blood all over the front lawn. Not on the same year as the 5 Little Pumpkins "set-up". Just to be clear becuase that would be "creepy". THAT is how much I LOVE Halloween!! I am pretty sure I am setting my kids up to loving Halloween just as much as me and I couldn't be more proud! Of them, not me. Ok, me too! LMAO! Anywho, for the last two Halloween's I got to pick the kids costumes because they were too young to care pick one themselves. 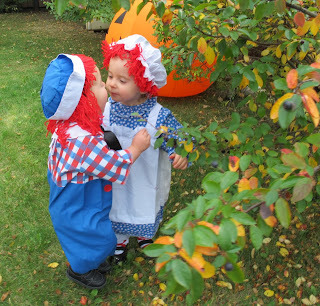 Last Halloween, they were Raggedy Ann & Andy...do you see the whole "twin" thing happening?!?!?! Bryce, well, like I mentioned, he didn't really have a thought on who he wanted to be so I went with Russell from the movie "UP", for TWO reasons. The first is when I saw this movie I immediately pictured Bryce being that "adorable, well-meaning pain in the a$$"...LOL! The second reason? Daddy Dave needed a costume and so he's going to be the Old Guy from "UP" because he's cranky all lovey-dovey like that...LMAO! It's gonna be a total hoot! I will post pictures next week for your amusement enjoyment! Only when I told Bryce who he was going to be (Russell, the Boy Scout) and who Daddy was gonna be (The Cranky Old Guy) he had a total fit. Like, lost his mind kinda fit! After I calmed him down I asked him what the problem was. He responded, "I'm not Russell. I'm gonna be Scout Guy!" (You know 'cuz daddy is the old "guy" so he's gotta be the scout "guy"...too funny!) So, were going with that! So there you have it...My Little Rapunzel & Russell from the movie "UP" (a.k.a. Scout Guy)!!! She looks totally thrilled and he does not! I guess next year he'll know better to pick his own costume...lesson learned...LOL! Go Get Your Inspiration On Over at Mama's! Oh my gosh...SO cute!! I love the Raggedy Ann and Andy costumes. Tangled is one of our favorite movies. Your daughter makes a very good Rapunzel. Happy Halloween!! Outfitting in costumes is always fun. I love it when they get to choose. The raggedy Ann & Andy picture is adorable. I love the movie up! And who knew he could be a costume? So cute! Oh. My. Goodness! The cuteness!! I love Bryce's expression in that first picture! I can't wait to see more pics. My two had no requests...I dont think they even know what is coming. SO...I went with what I wanted--Mickey and Minnie! I am so stinking excited! Your daughter looks so pleased, you son...ambushed. My son didn't start picking out his costumes until he was three. 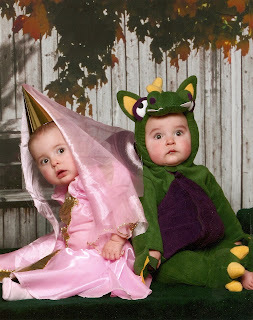 I was looking for Halloween costumes of Raggedy Ann or Andy with an axe in the head, and Google brought me here. I feel defrauded. Do you ever poke your kids awake? Crazy Hair Pumpkin...Go On Give It a "Pull"! !